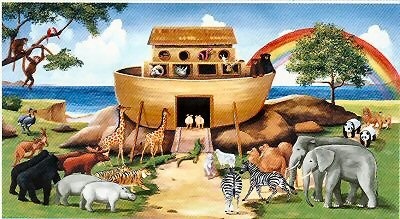 Parshat Noah tells us the story of the Great Flood. There are important parenting lessons in this parshah. At the opening of the parshah, we are told that Noah was a “righteous man, perfect in his generations; Noah walked with G-d.” Later on, one of Noah’s children sodomizes and castrates him. In the Torah’s previous parshah, Bereishis, a child of Adam and Eve murders his own sibling. While many people wonder “why bad things happen to good people,” another of life’s great mysteries is “why troubled children happen to good parents.” We can never fully understand the reason, but it is a fact of life that there is a limit to cause-and-effect in parenting. There are high-achieving, resilient people who come from highly “dysfunctional” homes, and there are loving, involved parents who suffer the heartbreak of having troubled children. One byproduct of this disconnect between our parental input and our children’s outcome, is that having children is one of the best ways to connect with Hashem. Those of us whose mind wanders during prayer may find our concentration sharpened when we need help in parenting our beloved children. Having children is also the ultimate antidote of pridefulness. There is often an inverse relationship between the age of our children and the size of our ego. Those of us who parent adolescents lose our arrogance real fast. We outgrow the trill of out-bragging other parents in our playgroup, exaggerating the number of languages our toddlers speak. We’re happy if our children are under incarcerated. The soul-wrenching hurt that comes with having troubled offspring usually strikes during our children’s adolescent years. The common denominator of most of the ways that our adolescents get into trouble is that they are uniquely susceptible, by virtue of their age, to addictions.